Steven Neeposh, with his wife by his side, gives testimony to the Truth and Reconciliation Commission. This past week in Montréal was the Truth and Reconciliation Commission (TRC) of Canada‘s Québec National Event, the fifth of seven such gatherings across the country. 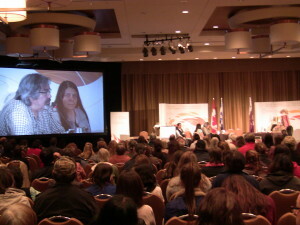 From April 24-27, an estimated 12,000 visitors stopped in to the historic Fairmont Queen Elizabeth Hotel, and some 8000 tuned in online, to engage in the process of learning about this history, what exactly the residential school experience meant for survivors and for the country as a whole, and how we can move forward. “The important thing that I do want people to understand is that this is not an Aboriginal problem, this is not just for Aboriginal people to address. The issue of the impact of residential schools upon this nation is an issue that the nation as a whole needs to address, and then as a country, as a future nation of this world, we will be in a better situation when Aboriginal and non-Aboriginal people have full mutual respect for each other, and that’s what reconciliation is all about,” says Murray Sinclair, Chair of the TRC. There were a number of different activities over the four days. It began with the lighting of a sacred fire, and there was also a Survivors’ Walk and Procession before the welcome and opening ceremonies. There were many different sessions in the schedule, and also various exhibits and displays, but the main focus was on residential school survivors sharing their experiences. There were Commissioner Sharing Panels in the largest room, where survivors shared their experiences with one or more of the three TRC Commissioners and a large audience, as well as slightly smaller Sharing Circles facilitated by the TRC Indian Residential School Survivors Committee members. NDP MP Romeo Saganash was the highest-profile survivor to share his story at the gathering. He spoke of how he, and all others who attended residential schools, “can never be normal” after the experience. He told of how his brother died in his first year at residential school, and how it took 40 years and his sister working at CBC to be able to locate his grave. He denounced the current government’s approach to handling Aboriginal issues, and gave the commission some recommendations for how this country can move forward positively. The TRC collected a total of 162 survivor statements during the four days, but, as Sinclair explains, “altogether as Commissioners we’ve probably visited over 500 communities” across the country collecting testimonies. They are done both to preserve a record of history, and to contribute to the final report and recommendations that the TRC process will culminate in. “Our first recommendation, right from the outset of the Commissioners’ Interim Report, was to undertake a process of ensuring that curriculums in this country, the public schools, teach children properly about who the Aboriginal people are, who they were, what they have contributed to the history of this country in a positive way, and how they have been victimized … and in doing that, we can help Canada as a whole overcome its national shame,” say Sinclair. The first part of the first day of the gathering was only open to school groups, who had a chance to come and learn more, but also for many of them to share what they had done as participants in the innovative Project of Heart initiative that allows students or other groups to learn about, commemorate and take action on the residential school legacy. Another educational initiative, The Wampum Project, has been travelling across Québec raising awareness about residential schools and was described by Marcel Petiquay in his testimony. Petiquay shared how he “was taught violence in residential school,” and chose to be violent as a result — one story that illustrated this was how his then-girlfriend bought him a present of perfume, the smell of which reminded him of the abuse he’d received at the school only months earlier, and he proceeded to be violent towards her. Petiquay also talked of his alcoholism, having started drinking at the age of 10 after being abused by a priest, and how it has been a very long journey to start the communication, to start the healing. Looking at the bigger picture, he stressed that child protection agencies are still taking away Aboriginal children from their families, and also how disheartening it is that healing programs funding are being cut. The support that healing programs can offer is vital now and in the future in addressing the legacy of residential schools. There were support workers on hand at the gathering to help survivors in dealing with whatever might come up from hearing the testimonies. Not everyone is or was ready to share their personal stories of hurt, pain and abuse. In testimony, Debby Flamand talked about how when her alcoholic father first learned that there would be the TRC and the sharing of residential school experiences, he attempted suicide, shooting himself in the head. The bullet went out the other side, leaving him alive but blind. She herself spoke of breaking the taboo in her community of denouncing the culture of domestic violence and the legacy of residential schools; she had also, earlier, lost her sister to suicide. David Decontie shared his own experiences of around 10 suicide attempts while addicted to alcohol, and then later while sober being too scared to die to attempt it anymore. He said, “I was like a stranger within my own family once I got out of residential school,” and talked about how he didn’t have a sense of belonging or any friends. Communication was a big problem for him, often happening only after having been drinking. Decontie also lost his language at residential schools, suffering beatings and soap being shoved in his mouth for speaking his Native tongue. He feels it’s really important that gatherings also happen for the young people, for the children of residential school survivors, so they can have their say too, as it has such huge intergenerational effects.